In order to be a responsible vehicle owner, you must perform routine maintenance on your car. One (or four) of the most important items you must maintain are your tires. Healthy tires are mandatory if you expect to arrive at your destinations efficiently and safely. The experts at MyDriverLicenses.org recommend checking the air pressure in your tires every month. You should especially pay close attention to your tires as seasons change. Drastic changes in temperature – from a warm day to a snowstorm – can affect the pressure of your tires. Typically, your dashboard should alert you about low tire pressure, but the process to fill your tires with air is in your hands. The team at MyDriverLicenses.org has taken the time to outline the steps to fill your tires with air easily. Check the tire pressure with a gauge – Make sure to measure your tire pressure with the tire pressure gauge. If you do not have one, pick one up at an auto parts store near you. According to the team at MyDriverLicenses.org, a basic gauge costs about $5. To check the pressure, find the valve on the tire, which is located by the rim, and unscrew the cap. Then, press your pressure gauge (the open end) into the open air valve. Let the air rush, as the gauge performs the reading based on the air that is forced out. Then, pull the gauge away and read the results. Decide on how much air is needed in your tires – Based on the gauge reading, you can then determine how much air your tires need. Typically, tires require 30 to 35 psi (pounds per square inch), though some cars have different estimates for front versus rear tires. Check your car’s manual to find out what the required levels are, so you can fill the tires accordingly. Locate an air pump made for tires – In order to begin this process, you must locate an air dispenser station. Oftentimes, you can find tire air dispensers at gas stations. Have some coins handy, so you can feed the air pump the required amount to fill your tires. Remove the air valve caps – This step should be performed one tire at a time. Remove each tire’s air valve cap as you rotate around the car. Place each cap in a safe, accessible place – like your pocket – so you can replace the caps immediately. Hook the pump up to your tire – Simply press the tip of the pump up to the tip of the tire’s air valve. You will hear a humming once the air begins to flow, which signals that the air pump is ready for use. 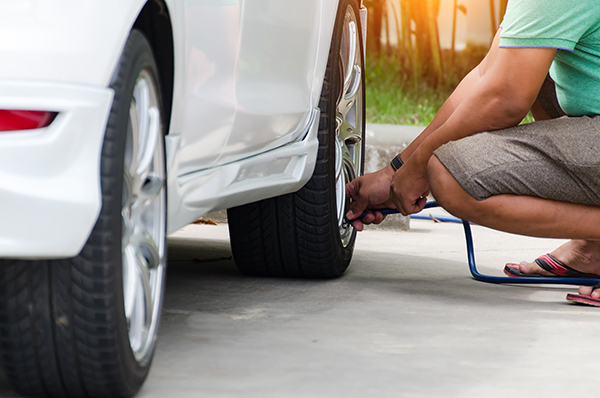 Fill your tires with air – Depending on the current tire pressure, this step can take from 10 seconds to a couple of minutes. Check the pressure, once again – Before you leave the air pump, check the pressure of your tires with your gauge device, so you can confirm you have filled your tires with the required amount of air. If the reading is low, add more air. And, if the reading is too high, release some of the air. Replace the valve caps – To secure air in your tires, you must screw the valve caps back on as soon as possible. The experts at MyDriverLicenses.org remind you to make sure all valve caps have been replaced securely before you drive away.